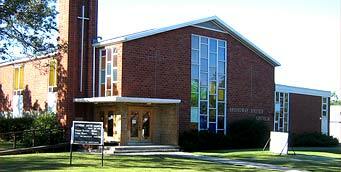 Broadway United Church is a worshiping community proclaiming the good news of Jesus Christ and being a living example of love and fellowship in a broken, divided world. You are wonderful - You are marvelous - You are one of a kind - A child of God and God loves you lots. To all who confess themselves to be sinners, humbling themselves before God and believing in the Lord Jesus Christ for their salvation, I declare this sure promise: "If we confess our sins, God is faithful and just and will forgive us our sins and purify us from all unrighteousness"
Feel free to join us Sundays at 10:00AM. Remembering/Honoring people in the bulletin: for the cost of $40.00 to cover the cost of printing the weekly bulletin, a special occasion such as a birthday, anniversary or in remembrance of someone special can be announced. Please contact the church office for further details. MP3 Streams of the worship service are available. Please see the link located under the heading of "Worship Information" located on the left hand side of the page.